I have watched many videos on YouTube and read many posts on this forum and vortex. 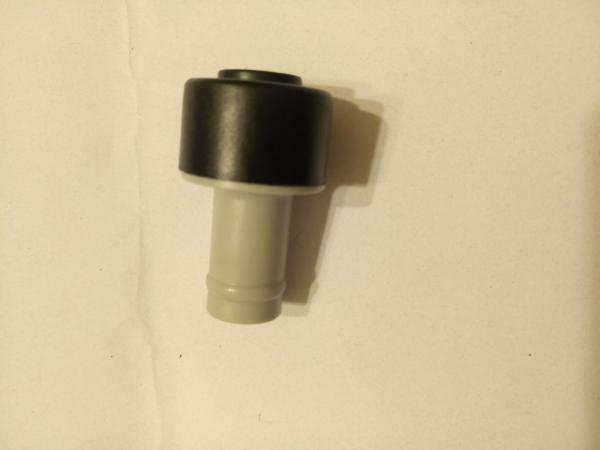 No matter what, I am simply not able to locate the PCV valve. This is so darn frustrating to me. Could someone very specifically mention where exactly the PCV valve sits in a AWM engine (1.8T 2002 B5.5). Last edited by Emry; 03-25-2019 at 05:44 PM. Locate the intake casting. It's one piece, then branches off in to four parts, one per cylinder. The PCV valve is around 4 inches below the rear-most branch. 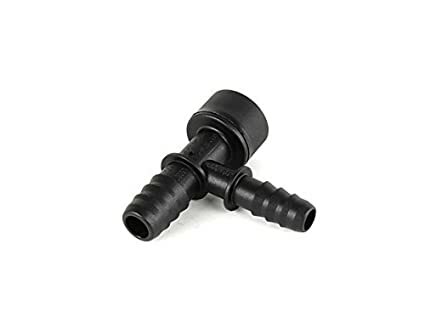 It essentially hangs in the air--one end is in a tee, the other end connects to the hose that connects to the rear of the cam cover. I tried to see it but couldn't. How do you access it if it's below the rear-most branch? 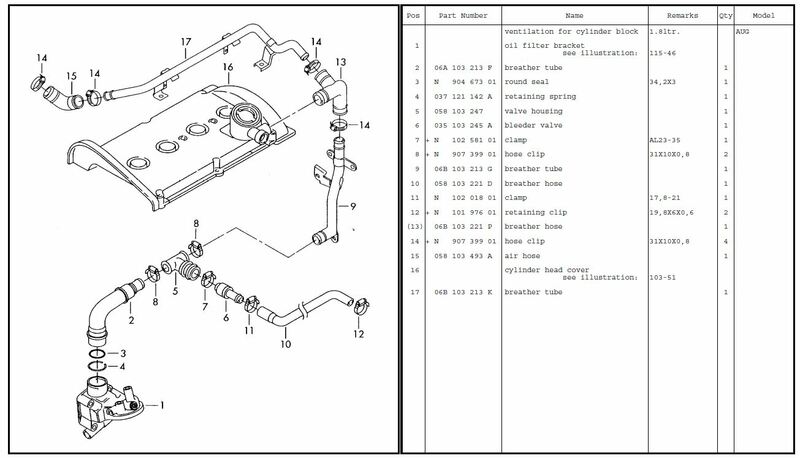 Lift the coolant tank (unplug electrical connector, leave hoses connected, as you probably know). If your hands aren't too big you can get to it, but beware of other brittle stuff down there (e.g. vacuum lines). I changed my PCV and the associated hoses without removing the intake, but it was a chore. Biggest caution: frontwards of the tee where PCV valve connects is an elbow down to the engine. That piece will be very brittle, and the pieces want to fall in to the engine (!). It's held in with a very reluctant clip. Don't remove it if you don't have to. I installed an 034 Motorsport silicone hose & billet aluminum PCV kit, which replaced all the above parts, so I undid all the PCV valve clamps after it was out of the car. But then I spent the next two hours fighting with the above mentioned elbow and picking parts of it out of the engine (and praying I didn't miss any). cchief22 and Emry like this. Lift the coolant tank (unplug electrical connector, leave hoses connected, as you probably know). If your hands aren't too big you can get to it, but beware of other brittle stuff down there (e.g. vacuum lines). I changed my PCV and the associated hoses without removing the intake, but it was a chore. Biggest caution: frontwards of the tee where PCV valve connects is an elbow down to the engine. That piece will be very brittle, and the pieces want to fall in to the engine (!). It's held in with a very reluctant clip. Don't remove it if you don't have to. My younger son and I did mine (2001 AUG 1.8T) several months ago. We left the intake manifold intact, but the job was a bit challenging. I had started the job earlier and quickly concluded that I should abort, buy new elbow and T fittings, and then not have to worry about damaging the old ones. I bought the whole kit and confirmed that being able to destroy the old hoses and plastic fittings made the job go much faster. Yes I have to the conclusion that it's the best way to do this. It costs a bit more but it's more secure. I'm going to order the hoses and wait a couple of weeks so the weather is a bit warmer. It's no fun to work on the car in open air in this cold condition. I've done the "PCV" a few times. The proper name for that valve is the "bleeder valve". 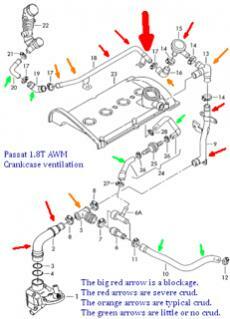 Bad valve symptoms are usually misfires due to a vac leak or loss of boost pressure. The stopper in the bleeder valve (one-way valve) can become off center and allow air through when boost rises under a load. You'll want to replace #2, #5, #10 and of course, the bleeder valve at least. That L-shaped tube at the far right that leads up to the back of the valve cover is metal. Just run some cleaner and a brush through it. It's not a hard job if you have EVERYTHING on hand. Don't plan on trying to save any of it. Not worth it. Cleanest way ids to remove it all, including the metal tube and install the 034 kit. The metal tube can be a PAIN to remove. It is bolted to the firewall and has a couple of wires clipped to it. Bad valve symptoms are usually misfires due to a vac leak or loss of boost pressure. I certainly do have the loss of boost pressure. The engine struggles especially when it's cold. You'll want to replace #2, #5, #10 and of course, the bleeder valve at least. What are the names (part numbers) for #2 and #10. I already have the bleeder valve. So need to order the other two hoses only. That L-shaped tube at the far right that leads up to the back of the valve cover is metal. Just run some cleaner and a brush through it. Yes I can clean up the inside of it with some cleaner. The metal tube can be a PAIN to remove. It is bolted to the firewall and has a couple of wires clipped to it. I have noticed it. But what is actually easy on these cars? I wouldn’t remove the metal tube unless you are replacing it all with the 034 kit. Leave it in place if just cleaning. I'm planning to just replace the bleeder valve and the other two T and hose. Here ya go with part numbers. 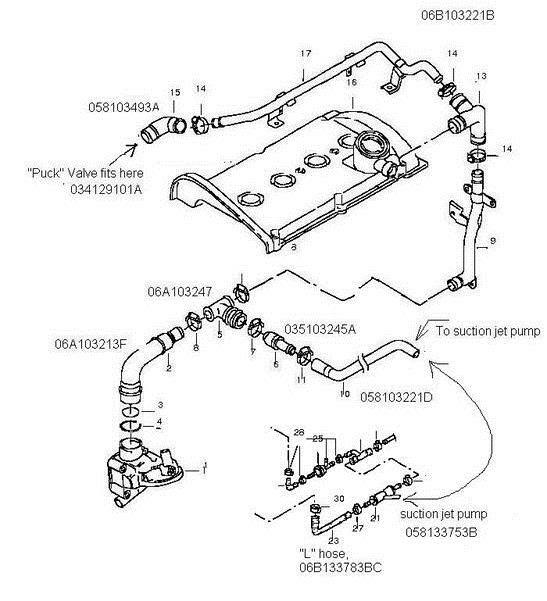 I know I have a new "T" hose (5), upper Y hose at the valve cover (13) and possibly even the Bleeder valve (6A) laying around I can make you a deal on. Whatever you do, DO NOT buy an aftermarket breather tube #2. They just don't fit right into the metal bracket or at all. I bought all that before deciding on just getting the 034 kit after effing around with an aftermarket #2 breather tube. Thanks for the part numbers. I already have the bleeder valve (6A). I have also recently removed and cleaned the Y hose (#13). So I'm in need of the T hose and #10 hose (I say #10 per your earlier post). Which bleeder valve did you get? 6A is not the correct bleeder valve for a 2002 AWM. You need #6, which is 035 103 245 A . 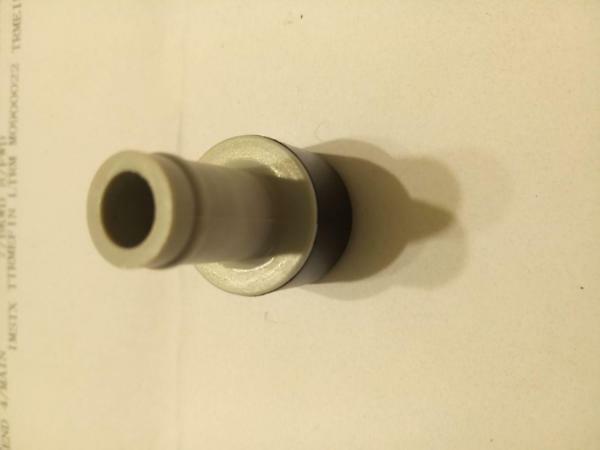 You may also need a suction jet pump (058133753B), it clogs easily. Your breather system should look like this instead of the 2003+ image above. Also, I would go ahead and remove the intake manifold, It's not hard at all. Makes everything so much easier. Which bleeder valve did you get? Woodward is correct. I didn't have the early AWM/AUG breather pic to attach. Even if you got a 6A by mistake, you can always just put a vacuum cap on the side port of it. Last edited by VAGguy; 03-28-2019 at 03:20 AM. You don't really need #10 hose up to the intake manifold if it's not torn or abraded. After watching a few videos, I think I'm comfortable to remove the intake manifold. This way, I will have plenty of room to chnage these suckers and not breaking (hopefully!) anything. This will also let me to take the fuel injectors out and clean them (for the first time after 18 years!). The SJP is a good idea if you've never replaced it. I recall a few years back I did replace a 3-way valve. I think that was SJP if I'm not mistaken. That's because the pixel sizes of your pics are too big. Open them in "Paint"and resize them by percentage. For instance, open the pic and resize it to the 20% of its original size. Save and upload. That should correct the issue. After you mentioned it , I watched a few video and I think it's not that hard and doable. Do I have to buy new clips and o-rings for the fuel injectors? I plan to clean the injectors when I remove the intake. I would go ahead and replace the o-rings. Can I get this from AutoZone or need to go to the stealership? 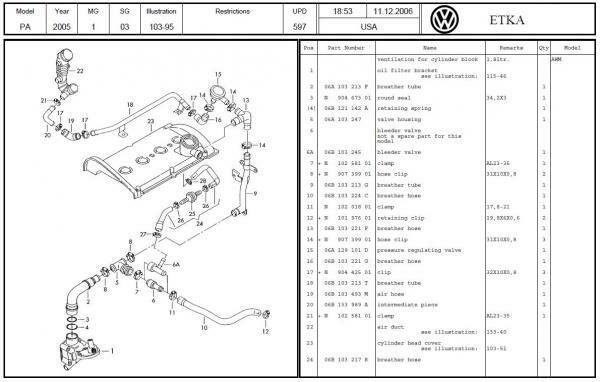 Do you have the part number by any chance? I like that second kit. Includes all 8 o-rings and looks to be some assembly lube as well. Oh, I found the pics of what a Bleeder valve looks like when it fails. There are 8 o-rings? I thought only 4. Need to look more carefully because I was about to go to Autozone and buy 4. 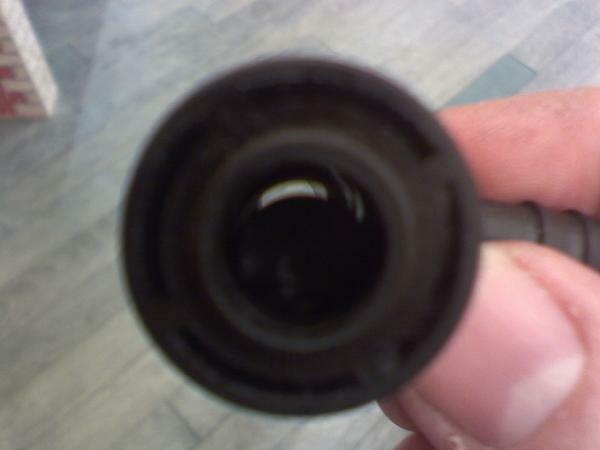 There is an O-ring at both ends of the injector. If just pulling the rail in one piece, then you just need the bottom ones for the manifold. At least you’d have the rest if something went wrong or you decide to do the o-rings at the fuel rail end of the injector. Good point! Actually I want to to completely take out the injectors and clean them througly. They've been sitting there for 18 years now and I'm sure they need a major clean up. No wonder engine doesn't have any power. So, I'll get the 8 ring packet from Autozone because that's the cheapest I found. Even on eBay they were more expensive. Yesterday we have a big snow burst. It's freezing so I need to wait a few days to get a better weather. Cleaned the injectors and replaced their o-rings. Didn't notice much difference in power or fuel economy. But it was a cheap and relatively easy thing to do so I'm not disappointed. While at work, believe it or not , after nearly 8 years I finally found the damned bleeder valve. It was too late and rain started so I just quit. But my next move it to attack the valve. I saw two one-time clippers which I'm sure will be tough and frustrating to remove. But, hey, after 18 years on top of her I'm scared of nothing no more. Bad News: I'm not sure but I think the oil cooler is leaking. I had cleaned the area underneath of it a few days ago and today I saw a spat of oil there again. If that's true I think I will mourn for 7 days. I don't think changing that gasket would be straight forward. Last edited by Emry; 04-08-2019 at 06:49 AM.